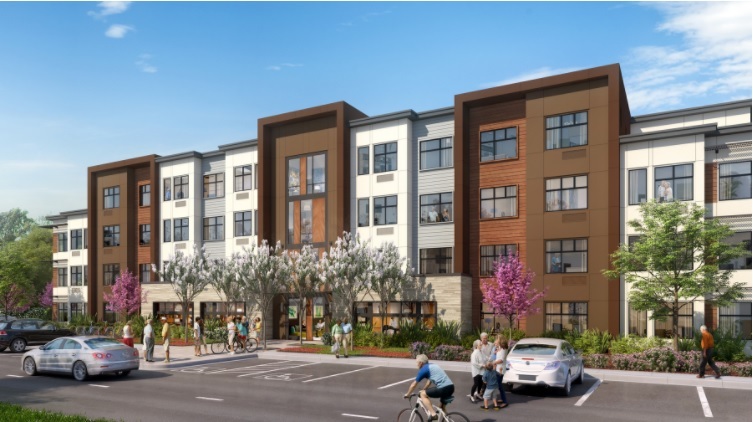 OAKLAND, CALIF. – (RealEstateRama) — International award-winning firm KTGY Architecture + Planning announces that nonprofit developer Eden Housing and the City of Fremont will celebrate the groundbreaking of a new affordable housing community at 47003 Mission Falls Court in Fremont, Calif., on Friday, October 13th, at 12 noon. Mission Court Senior Apartments will provide 90 one- and two-bedroom apartment homes for very low and extremely low-income active adults 62 and better who earn between 30 percent and 50 percent of the Area Median Income (AMI). The new apartment home community is located in the Warm Springs area of Fremont on a 2.25-acre site on the corner of Warren Avenue and Mission Falls Court, near transportation, shopping and services. According to Jessica Musick, associate principal in KTGY’s Oakland office, the design articulates a modern architectural style which serves to update the predominantly older office park neighborhood. “The contemporary design continues a California legacy of simple, clean lines combined with energy efficiencies to create affordable housing that is sustainable and comparable to market-rate housing,” said Musick.